My first ever Cordovan shoes. 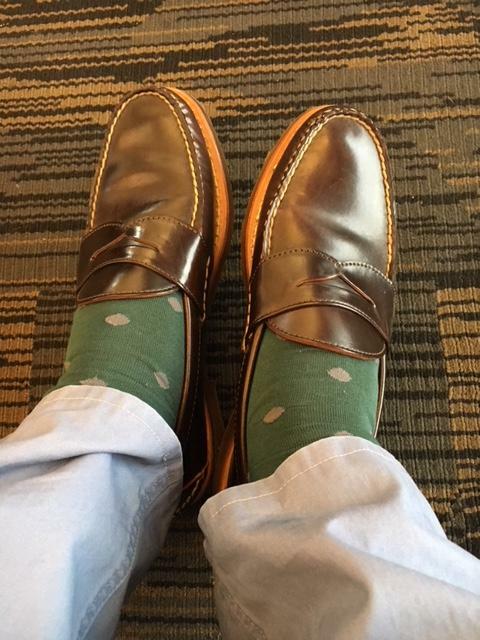 These are Tricker's Bobby Cordovan in Oceano Blue (they look more of a sea green to me). Very pleased with them. Thanks to @007Bond for selling them to me. Trickers has some really cool shell colors! I guess I am keeping this excellent vintage pair of Allen Edmonds Hinsdale in Black Cherry Shell loafers. I located them in an old 1997 Allen Edmonds catalog so about 22 years old. When I bought them they had very little wear I would say maybe one full work day or several easy days and the soles were hardly scuffed. I really did not need them so I had put them up on eBay with AE shoe trees and the shoe bags. But after 2 months and many pathetic offers I gave up. I mean I was getting offers in the sub $100 range serially with AE trees and bags get real. If you can't even get what it cost for a resole for an almost new pair of shoes just keep them especially shell. Since they are so clean I have just been using them for home office days (like today), they fit me well like slippers. I think since Steves shoes sells Allen Edmonds 3rd with no warranty so cheap that brings down the value of Allen Edmonds shoes on eBay. He generally takes 60% of his ask and I notice every time I put up a pair of Allen Edmonds I get offers of 60% or less. These were first with the shoe bags and shoe trees so I don't understand the low ball offers. Anyways I am enjoying them now. Agreed sea green but Oceano Blue sounds so much more exodic and fancy. Awesome shoes, those double leather soles are a tough cookie to crack, hopefully the little pre walking I did helps out. Also that Trickers shell is some heavy duty stuff. Glad you are enjoying them they look great on your feet!!! Mason Imperial shell LWBs. Very dark brown. Because they only worth that little to others. But they worth more to you. Most of time, used items only has value to original owners so don’t sell them. Crockett & Jones whiskey Lindrick boots. Why don’t you increase your price by 66.67% so that their 60% offers becomes your normal price? Or just don’t accept offers and ignore all offers until they sell. Shoes often linger for a while before selling, especially models with names not currently in use, unless they are ridiculously cheap. Yea but fair and reasonable list price is what I look for in an auction so I try to list the same way. You are correct in that they linger for a while as I have had pairs that just don't fit me that I just leave up and eventually they do sell. This pair did fit me well so it was not hard to decide to keep them after they did not sell in 2 months. Yes, but are they "brown" shell?